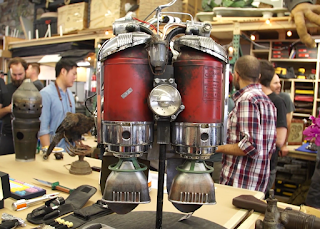 At the 2017 Replica Prop Forum Los Angeles Prop Party, my Tomorrowland jetpack replica took home the inaugural "Rusty Dremel" award! Tested.com's Norm Chan was on site to interview me about the pack, and while my voice was almost entirely gone after a full day of chatting in a loud prop shop, I was happy to regale him with some of the history behind the prop! Even after two years of tinkering, the jetpack is far from complete, but you can follow the progress in the group build thread on the RPF. For shots of the pack in action, check out these photo galleries from San Diego Comic Con and D23 Expo in 2015. In the video, did you mention a pdf of specifications of your build, including a parts list? I'd love to have it if one exists. Where can it be found? No PDF mentioned, but most of that information is available in the Replica Prop Forum group build thread linked in the article.